A sold-out charity event is hardly an unusual occurrence in the Nation's Capital. But a sold-out charity event at the Russian Embassy-that is also a party for university students, and a debutante ball, all at the same time-is not your typical Washington night out. 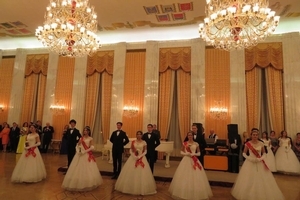 The Fourth Annual Tatiana Ball was held Saturday, January 26, at the Embassy of the Russian Federation. As dancers elegantly twirled and debutantes serenely paraded before a crowd of several hundred guests, it was apparent that this traditional annual festivity has firmly ensconced itself on the District's social calendar. "It's established," said Xenia Woyevodsky, a member of the Tatiana Ball Committee, Secretary of the Parish Council of St. John the Baptist, and President of the International Firebird Arts Foundation. "So we're on the map now." Tatiana Day is a Russian religious holiday named after Saint Tatiana. In 1755, Empress Elizabeth-the daughter of Peter the Great-signed a decree establishing a University in Moscow, and Tatiana Day also became the date to mark the birth of the first Russian university. Later, it turned into a festivity for all students, and is now celebrated as Russian Students Day. "For the first time, one of the debutantes is from the [Russian] Embassy," Ms. Woyevodsky also shared. "I think this opens it up for the future." And the Tatiana Ball continues to grow. "Next year, we're going to offer a weekend in Washington for young people, because there's been a lot of interest from Canada, New York, and from San Francisco and Los Angeles." Hosted by the Russian Embassy and organized by volunteers from D.C.'s Russian Orthodox Cathedral of St. John the Baptist, the Tatiana Ball also has numerous sponsors-including Carmel Institute of Russian Culture & History Founder and Advisory Committee Chair Susan Carmel Lehrman-who act as patrons to ensure the Ball's annual success. Each year, one hundred Carmel Institute students from AU and other local colleges attend. Many of these scholars are studying Russian culture and language. "This is my first time here", said Gabriella Folsom ('20), a History and Political Science Major-with a minor in Russian Language-at American University. "It's so lovely that [the Carmel Institute] provides this for us; we're very excited." Ms. Folsom shared her initial impressions: "It's absolutely beautiful…an absolutely fantastic event that I'm so pleased we get to go to." Ms. Folsom felt that such events provided her with a better understanding of Russia and its people. "Right now, being in a language class, we don't get too much of the cultural aspect of Russia," she observed. "And it's nice to get a full picture of what the Russian culture is like, especially for those of us that are going to study abroad in the future -- it's nice for us to actually get a preparation, and to understand what we're going to be immersed in…they have tremendous value for us." Celeste Smith ('20)-an AU International Studies major with a focus in Development and Environmental Studies-shared that she was visiting the Russian Embassy for the fourth or fifth time through the Carmel Institute. "It's really broadened my mind about Russian Culture," Ms. Smith said of her experiences. "I think communication through food, and through productive conversations, is so important." Cuisine, Ms. Smith noted, can have an important role in transmitting culture. "I'm taking a food policy course right now-and that's one of the ways culture is spread…it's looking at agricultural companies, as well as indigenous food culture, so we're getting a really global view on how food has impacted people." "I've never seen these parts of the Embassy before, and I think it's really amazing," said Ryan Fedasiuk ('19), a junior in the American University School of International Service who is minoring in Russian. "And I also think that this is a great way to broaden my language skills by speaking with native Russians-which is something that's kind of hard to do in class, outside of your individual professor. So you can hear more dialects, and broaden your language acquisition that way." The off-campus excursions, Mr. Fedasiuk emphasized, amplify his on-campus academic work: "I just love learning more about the culture, and seeing all the works of art in the Embassy, and tasting the different foods-because that's something you don't really get in the classroom." For more than 40 years, a lavish Russian New Year's Ball attracted Washington revelers to the Mayflower Hotel. It was conceived and hosted by the most prominent couple in Washington's Russian community, Princess Selene Obolensky and her husband Prince Alexis Nikolaevich Obolensky. As the Tatiana Ball website notes, the Oblensky's Russian New Year's Ball was "one of the most popular and elegant social events of the season. The Tatiana Ball is its reinvention-a commitment to Russian cultural traditions and support for charitable causes. Princess Obolensky's spirit lives on." Princess Oblesky was devoted to cultural and charitable events-and in her later years, she established a school for special needs children on the grounds of her husband's ancestral Russian estate. Her dedication to assisting others is also reincarnated in the Tatiana Ball-since the proceeds from the Ball benefit the St. John Benevolent Fund, which aids disadvantaged Russian children. "We've helped many, many people over the course of the year," shared Fr. Victor Potapov, Archpriest and Rector of the Russian Orthodox Cathedral of St. John the Baptist. "We helped the foundation of Dr. Yelizaveta Glinka, who was a selfless social worker who died last December with the Alexandrov choir. She was on her way to Syria on a humanitarian mission." Dr. Glinka's foundation-Fair Aid-was established in 2007 to operate charity programs for the homeless and seriously ill or dying patients. She was flying with the Alexandrov Ensemble-better known in the West as the Red Army Choir-to deliver a shipment of medicine for a Syrian hospital. The Tu-154 plane on which Dr. Glinka and the Choir were traveling was headed from Moscow to Syria when it crashed into the Black Sea, according to the Russian Ministry of Defense. "We sent money to children who were orphaned in the Donetsk region, also," said Fr. Potapov. "And we have a number of local families here who have sick children; there's a girl who's blind in Baltimore-she's at Johns Hopkins-and her parents are very needy. We're trying our best to get her treatment." Dr. Elizabeth Zelensky-a scholar, writer, and translator who teaches at both Georgetown University and George Mason University-is of the opinion that cultural outreach is essential to exchange and learning among young people. Its value is, she said, "inestimable. Right now, there's such a climate of Russophobia-and this, on the contrary, puts everything on the individual, people-to-people level." "I think it's very interesting, the whole debutante thing-because I know in London, they have the Russian debutante ball. So obviously there is a need in Russian society, in the diaspora, for some kind of an ongoing tradition," Dr. Zelensky noted. Indeed, at the Tatiana Ball, tradition is in the air. There is a strong emphasis upon continuity of custom, and the passing along of cherished rituals-which can all too easily fall victim to a hyper-fragmented digital world. "It's a thread to the past," Dr. Zelensky observed. "I think we need to live in a multi-dimensional world-and I'm afraid that our video culture has made us two-dimensional. I see it, because I teach, so I see how my students have changed over twenty-five years…we have to help them; by creating a thread to the past we are helping them. It's not just for Russia-it's for everyone. Everyone needs a thread to the past." Photos from the 2018 Tatiana Ball can be viewed on the Carmel Institute of Russian Culture & History Facebook page.